Chemical spills and threats have become somewhat of a common occurrence in recent news with more and more incidents arising outside of the normal parameters of the typical chemical environment such as laboratories or chemical plant. Recently, chemical spills have happened with large semi-trucks filled with a “toxic” chemicals that have been releasing these chemicals onto the roadways – leaving a large decontamination job for HAZMAT to clean up and a huge risk factor to many civilians who could be potentially exposed. Each and every chemical decontamination will vary depending on the chemical spill at hand, making it difficult to deploy one specific guide for every chemical decontamination that is performed. However, what if there was a one-stop-shop chemical decontamination procedure you can take with almost every chemical spill? Below we are going to compare the main types of chemical decontamination for chemical spills and the benefits and cons of each to conclude the overall best process to utilize for future chemical spills & decon. Decontamination is the process of removing or neutralizing materials that have come into contact with or on personnel or equipment during a spill. Decontamination is set in place to minimize exposure and protect workers from the potentially hazardous substances. The first priority of the decontamination process is to avoid contact with the material or substance at all costs and establish a decontamination zone to block off to other people. Then, depending on the type of chemical spill present you will need to conclude the best type of decontamination procedure to implement. The most important and most effective decontamination of any chemical exposure is that decontamination is done within the first minute or two after exposure to the chemical agent. There are many different problems associated with potential decontaminants such as irritation of the skin, toxicity, ineffectiveness, or even high costs. The ideal decontamination will be rapid and completely neutralize all chemical agents. Chemical, Biological, Radiological, and Nuclear (CBRN) decontamination is the removal of CBRN material from equipment or humans. The military, first responders such as the fire and police departments, and HAZMAT teams are all trained and ready to deploy decontamination procedures quickly and effectively when need be. Chemical incidents can arise from an array of chemical accidents, human error, or a deliberate chemical attack, no matter what the circumstance before you are, being prepared with a set of decontamination procedures is critical. According to the National Fire Protection Association (NFPA), a hazmat response team is an “organized group of trained personnel operating under an emergency response plan and appropriate standard operating procedures who handle and control actual or potential leaks and spills of hazardous materials”. Most Hazmat teams believe water is good, soap and water are better, and chlorine bleach solutions are best when dealing with either a chemical or biological agent. Chlorine bleach is a widely used method for decontamination, however, chlorine bleach is quite potent and can cause severe damage to the skin and even blindness if contact occurs in your eyes. Chemical spills can be found in various forms from gas, liquid, solid, fumes, dust, fibers, or vapors. When any of these types of spills happen various methods of decontamination can be deployed including acid and base neutralizers, all-purpose absorbents, oil only absorbents, hazardous liquid absorbents, spill kits, decontaminating foams, and spill containment and material handling products. The list of different decontamination methods can vary in effectiveness, procedures, and implementation. 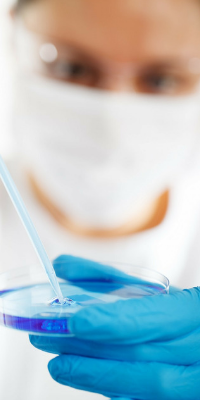 This method of chemical decontamination is used to treat only one type of chemical hazard. Therefore, a pre-treatment hazard identification is mandatory. Solid commercial neutralizers are used to treat only liquid hazards & can generate a significant level of heat that have the potential to become hazardous – and with excess of the neutralizer, a possibly corrosive situation is created. 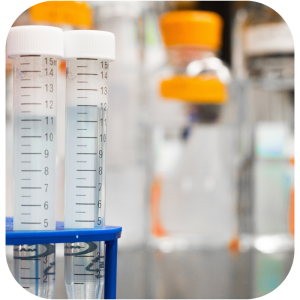 Chemical spill kits are a popular decon solution, particularly for laboratories and factories. However, chemical spill kits have many disadvantages including the time required to complete the decontamination process and the knowledge of the chemical present along with the ideal solution needed to neutralize the agent. Spill kits have separate products for acids, caustics, and solvents, and thus identification is required before treatment. And if the kit is applied improperly a dangerous product could form. Also, this method of decontamination is only applicable for liquid spills and cannot treat vapor hazards. If you are trying to neutralize Chemical Warfare Agents (CWAs) and organic hazards, a spill kit will not be an effective decontamination method to implement. Universal Neutralizing Sorbent is an effective decontamination method to clean up battery acids and bases, even hydrofluoric acid. This decon method can be applied to contain a liquid spill but is not effective towards the destruction of CWAs or any organic hazards – as well as vapor release decontamination. Sorbent based decontamination products were designed to be effective against chemical warfare agents such as Soman, Mustard, VX, etc. However, this decontamination method is not effective at neutralizing and eliminating most toxic industrial chemicals. Also, sorbent based decon products are only effective at liquid spills and not vapor releases. The majority of liquid decontamination products such as bleach or DS2 are corrosive products – and these liquid decontaminants are primarily used to treat Chemical Warfare Agents. Liquid decon products cannot be used on metals such as potassium or sodium and they are not effective against a wide range of toxic industrial chemicals. Most liquid decontamination products are water based and cannot be used at sub-zero temperatures – and most importantly, this decon method does not treat vapor releases in the environment. Decontamination foam is a spray-on cleaning solution that has a longer residence time on contaminated surfaces than regular liquids. This decon method is essentially water and a surfactant that creates an aqueous film forming foam that various reactive chemicals are then added to, resulting in the reduction of contaminants on the surface. Decontaminating foams are designed to treat chemical and/or biological warfare agents. This decon method has a large logistical burden due to water and ancillary equipment requirements as well as a need for premixing. Since decon foam is water based, they cannot be used in below freezing temperatures. 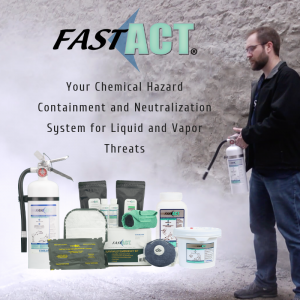 FAST-ACT is a proprietary formulation of non-toxic nano materials that are effective at neutralizing a wide range of toxic chemicals with the added capability to destroy chemical warfare agents. This decon method is effective against a wide range of toxic chemicals including acids, halogenated compounds, phosphorous compounds, acidic and caustic gases, organic compounds, and chemical warfare agents. FAST-ACT is offered in pressurized cylinders capable of addressing both liquid and vapor hazards as well as manually dispersed containers for liquid hazard treatment. 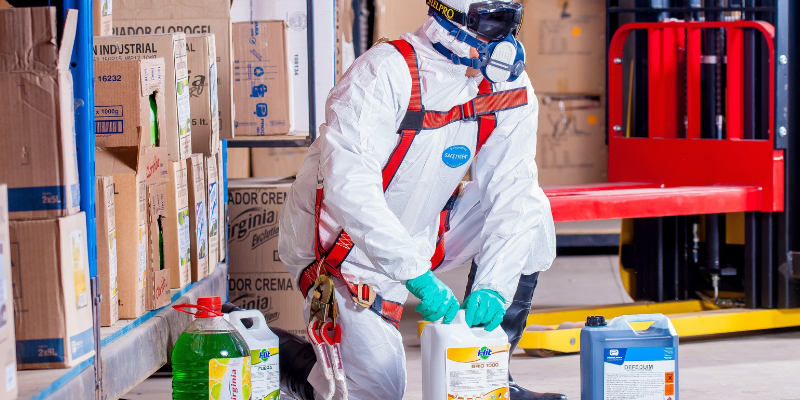 This decon method is effective against a broad range of chemical hazards and eliminates the need for multiple products, making FAST-ACT a one-stop-shop for any chemical decontamination. With FAST-ACT, containment and/or neutralization efficacy greater than 95% is achieved for most toxic chemicals within 2 minutes. Within 90 seconds over 99.6% (detection limit) of warfare agent is removed from surfaces. In 10 minutes 99% of GD and over 99.9% of VX is destroyed. After 60 minutes 70-80% of HD is neutralized. Chemical decontamination is vital for rapid and effective neutralization of hazardous chemical spills and releases. Decontamination is time consuming and requires resources to accomplish complete elimination, therefore being well-versed in the different chemical decon methods and their effectiveness can aid in the ideal decon selection for the most complete chemical spill decontamination.